Something that is always huge on my heart is the idea of community. Who is pouring into your life, and whose are you pouring into? After I graduated from college, I moved to DC for a couple of years. for coffee, conversation, and Bible study. talked about Jesus, and felt encouraged and challenged. one that shaped my world view, and how I think of community. Nick and I have a huge heart, a call really, for unity. As I've walked my own faith journey, I've seen division and judgement among believers. Assumptions and misconceptions that prevent us from being in relationship with one another. with others who don't think the way we do. who share a common love for Christ and a desire to know Him more deeply. all to the glory of God, all drawn to Him in different circumstances. And most recently, a small group of couples that meet every couple of weeks to talk about faith over coffee and dessert. From different churches and backgrounds and stories. These experiences are my heart's cry. To be in community with people who don't think exactly like I do, who I can learn from and grow with. When it comes right down to it, none of us have it all figured out. and live out what we think we're being called to. and we are sharing in that. That's what I'm grateful for this week, and all the time. 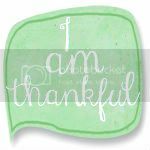 Every Thursday I host a link up asking you what you're thankful for. that we can be grateful for. I love reading your stories and sharing in your joy! Grab a button and click around to meet some new friends! I can only imagine how wonderful those Friday mornings must have been. How awesome that you've been able to find communities throughout your life. yes!!! community is such a necessary thing. we have been blessed to be surrounded with an incredible community here in louisville... these men and women sharpen, encourage, and challenge us daily. so grateful for community... and for people like you and nick that feel the call to bring others into strong community. thank you! I think community, and living in community is one of the most important things we can strive for as Christ followers. It's so vital for our growth because we all see life and scripture so differently. Love your heart for this and YOU Carina. Speaking of community, when are we going to commune over coffee? I think a little diversity within the Christian community is a lovely idea! You are so right- none of us has "arrived". We can learn so much from each other! friend. move to nj. jk. but not really. i think you'd love our community here. i pray someday you and nick can visit us. i know God calls us to different places because he needs us in every corner of the world. you're his disciple and doing his work for sure in your little area of the world. you're amazing and your story is amazing. so thankful to have heard your testimony... i hope you share it whenever you can! i love this. my husband are in this weird "in between" time with weird "in between" community, if that's even a thing. As a man, it seems he can get most of his fulfillment from our family and a couple friends, where as a woman, i CRAVE time with community. my prayer has been that God would give us the exact community He wants for us. this post just reminds me of why my prayer is so important. thanks for sharing your heart.